Our value chef jackets may be cheap in price but for the quality, the price of these kitchen jackets is amazing! This collection of cheap chef whites are unisex and have long sleeves to protect your arms whilst working. Made from a hard wearing polycotton, these white chef jackets are suitable for commercial laundering and are a good option for new chef's or kitchen staff that get through clothing quickly! With a thermometer pocket on one sleeve too, it is no wonder this is one of our bestselling chef jackets! These low priced white chef jackets are available in four sizes to fit chests between 34” and 48” and are in stock ready to be delivered next day! 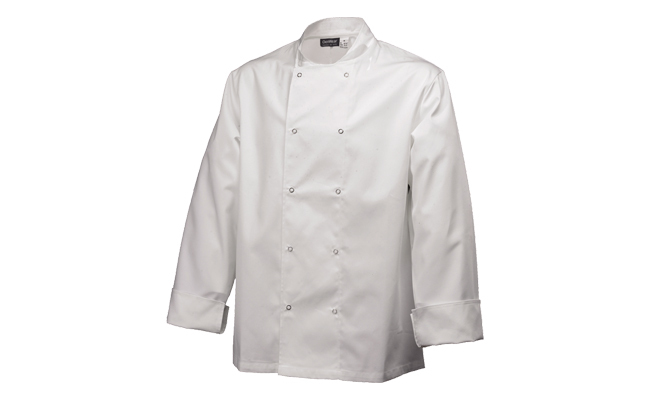 Here at Pattersons Catering Supplies we stock a comprehensive range of chef jackets, chefs clothing and chef whites. To find our more, please browse through our chef clothing. You never know you may find the perfect chefs trousers to match your new chef jacket!